This overview essay provides highlights from more detailed essays illustrating and describing topographic map evidence which is interpreted to determine origins of drainage divides between all major Platte River tributary drainage basins and Platte River drainage divides with all major adjacent drainage basins. Detailed essays upon which this overview essay is based used topographic map evidence and there has been no effort to introduce evidence from other sources. The detailed essays can be found under Platte River on this website’s sidebar category list. The Nebraska Platte River is formed at North Platte, Nebraska, where the northeast-oriented South Platte River joins the southeast-oriented North Platte River. From North Platte, Nebraska the Platte River flows in a southeast direction to Kearney and then in a northeast direction to Columbus. East of Columbus at Fremont the Platte River turns to flow in a south-southeast and south direction before turning to flow in an east-northeast direction to Plattsmouth, where the Platte River joins the south-southeast oriented Missouri River. The Platte River valley was eroded at a time when massive glacial melt water floods were converging in Nebraska. Flood waters were derived from a rapidly melting thick North American ice sheet and each flood used a different flow route to reach Nebraska. One flood flowed in a southeast direction along the decaying ice sheet’s southwest margin and flowed across the entire state of Nebraska, another flood emerged from giant ice-walled canyons carved into the decaying ice sheet’s decaying surface and flowed in a south direction across eastern Nebraska, and another flood flowed in a southeast direction through the present day Rocky Mountains and was systematically captured by headward erosion of Platte River tributary valleys as the Rocky Mountains were uplifted. Melt water floods flowing along these different routes converged in the state of Nebraska, which probably caused significant flood water ponding. Headward erosion of the Platte River valley and tributary valleys across Nebraska probably drained the ponded flood waters into what was at that time the newly eroded Missouri River valley and beheaded southeast-oriented flood flow routes to actively eroding Kansas River tributary valleys. Headward erosion of the deep Missouri River valley and its tributary Niobrara River valley beheaded southeast-oriented flood flow routes to the newly eroded Platte River valley in Nebraska. At approximately the same time Rocky Mountain uplift was reversing and otherwise altering flood flow routes in the Colorado and Wyoming Rocky Mountain region, which eventually beheaded all Rocky Mountain flood flow routes to the Platte River valley system. Figure 1: Regional map illustrating drainage routes in Wyoming, Colorado, Nebraska, Kansas, and South Dakota (select and click on maps to enlarge). National Geographic Society map digitally presented using National Geographic Society TOPO software. The Platte River drainage basin is one of the largest Missouri River tributary drainage basins and includes large areas in the states of Nebraska, Colorado, and Wyoming. The purpose of this Platte River drainage basin landform origins overview essay and its related detailed essays is to use topographic map evidence to illustrate and describe Platte River drainage basin history. Detailed essays for Wyoming and Colorado Platte River drainage basin areas have not yet been published and are scheduled to be published on this website in late 2012 or early 2013. Detailed essays illustrating and describing most Nebraska Platte River drainage divide areas including the tributary Elkhorn and Loup River drainage basin areas, have been published and can be found under appropriate river names on the sidebar category list. Regional map evidence in this overview essay and the more detailed topographic map evidence used in all detailed essays has been interpreted in the context of the “thick ice sheet that melted fast” geomorphology paradigm, which is fundamentally different from the paradigm most previously published interpretations have used. Paradigms are frameworks of ideas upon which research is based and by themselves are neither correct or incorrect. What distinguishes one paradigm from another paradigm is the paradigm’s ability to answer research questions and provide opportunities for further research. Some paradigms are highly productive and enable researchers not only to answer their research questions, but also open up numerous new research opportunities. Other paradigms do not provide researchers with the ability to answer their research questions and severely restrict future research opportunities. Most previously published Platte River drainage basin (and Missouri River drainage basin) geomorphology interpretations are based on a geomorphology paradigm that is unable to answer many geomorphology research questions. The “thick ice sheet that melted fast” geomorphology paradigm provides a framework of ideas that does permit geomorphologists to answer many of those previously unanswered research questions. This overview essay provides a sample of the previously unanswered geomorphology research questions and a few examples of how the “thick ice sheet that melted fast” geomorphology paradigm answers those questions. Figure 1 is a regional map illustrating the Platte River and tributary drainage routes in Colorado, Wyoming, and Nebraska. The Platte River itself is formed near North Platte, Nebraska at the confluence of the North and South Platte Rivers. From North Platte, Nebraska the Platte River flows in a southeast direction to near Kearney and then turns to flow in a northeast direction into eastern Nebraska. In eastern Nebraska the Platte River flows in an east direction and then turns to flow in a south-southeast and south direction before turning to flow again in an east direction to join the south-southeast oriented Missouri River. Major eastern Nebraska Platte River tributaries include the Elkhorn and Loup Rivers. The Elkhorn River generally flows in a southeast direction and then turns to flow in a south-southeast and south direction to join the south-oriented Platte River. Detailed essays describing Elkhorn River drainage divides areas are found under Elkhorn River on the sidebar category list. Major Loup River tributaries begin as east or east-southeast oriented streams in the Nebraska Sand Hills region and then turn to flow in southeast directions to join the northeast-oriented Loup River. While not visible on regional maps used in this overview essay the northeast-oriented Loup River flows for a considerable distance along the northwest wall of a broad northeast-oriented valley also used by the parallel northeast-oriented Platte River, which flows along the valley’s southeast wall. Detailed essays describing Loup River drainage basin drainage divide areas are found under Loup River on the sidebar category list. As already mentioned Loup River headwaters are located in the Nebraska Sand Hills region, which includes much of the western Nebraska region between the Niobrara and Platte Rivers which is located east of Alliance, Nebraska and the west of the southeast oriented Loup River tributaries. South of the Platte River drainage basin in eastern Nebraska is the Big Blue River drainage basin, with the Big Blue River eventually joining the east-oriented Kansas River. Note on figure 1 how Big Blue River headwaters originate almost next to the Platte River (near Central City and Grand Island, Nebraska) and then flow in an east-northeast direction before turning to flow in a south-southeast direction to join the Kansas River. The origin of Big Blue River and Big Blue River tributary headwaters almost on the edge of the northeast-oriented Platte River valley is evidence headward erosion of the northeast-oriented Platte River valley beheaded multiple flood flow routes moving flood waters to what at that time was the actively eroding Big Blue River valley system. Detailed essays describing Big Blue River drainage basin drainage divide areas are found under Big Blue River on the sidebar category list. South of the Platte River drainage basin in western Nebraska is the Republican River drainage basin, with the east-oriented Republican River turning (near Superior, Nebraska) to flow in a southeast direction to join the east-oriented Kansas River. Detailed essays describing Republican River drainage basin drainage divide areas are found under Republican River on the sidebar category list. 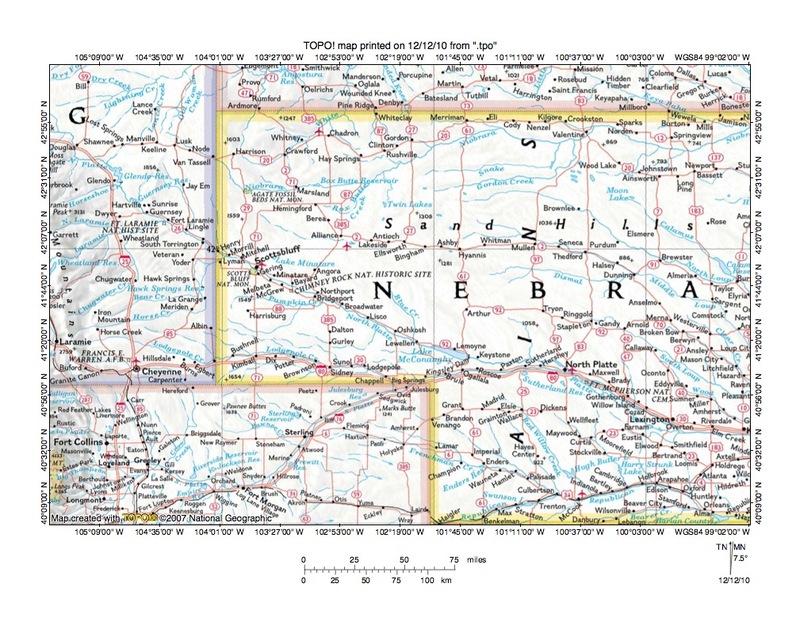 While regional maps such as those used in this overview essay do not show most tributaries between the Platte River and Republican Rivers in western Nebraska, detailed topographic maps do illustrate the tributaries and their valleys. The detailed topographic maps used in the detailed essays provide evidence Platte River valley headward erosion beheaded multiple flood flow routes to what must have been actively eroding Republican River tributary valleys. Figure 2: Regional map showing major drainage routes in the Platte River headwaters region in Wyoming and northeast Colorado. National Geographic Society map digitally presented using National Geographic Society TOPO software. Figure 2 is a regional map illustrating the relationship of Platte River headwaters in Wyoming and Colorado with adjacent river systems. While difficult to see on figure 2 the South Platte River originates west of Colorado Springs, Colorado (near figure 2 south center edge) as a southeast-oriented river and then turns to flow in a north-northeast and northeast direction to the Colorado northeast corner (figure 3 better illustrates the southeast-oriented South Platte River headwaters). South Platte River headwaters and major east-oriented South Platte River tributaries originate in what is today the high Rocky Mountains Front Range. South of the South Platte River headwaters is the southeast-oriented Arkansas River (see figure 1). West of the southeast-oriented Arkansas River and South Platte River headwaters are northwest-oriented tributaries to the southwest-oriented Colorado River headwaters valley, located on the Front Range west side. The North Platte River originates west of the Medicine Bow Mountains in north central Colorado and flows in a northwest direction into Wyoming where it jogs to the northeast and northwest again before turning to flow in a northeast direction to Casper, Wyoming. From Casper the North Platte River flows in an east and southeast direction into western Nebraska. The Laramie River is a major North Platte River (unlabeled in figure 2, but flowing through Laramie, Wyoming) which originates in northern Colorado east of the Medicine Bow Mountains and west of the Front Range. The Laramie River flows in a northwest direction to the Wyoming state line and then in a northeast direction to Laramie. From Laramie the Laramie River flows in north and northeast direction across the Laramie Mountains to join the southeast-oriented North Platte River. Another significant North Platte River tributary is the east-oriented Sweetwater River, which originates near South Pass and which joins the North Platte River near Pathfinder Reservoir (south and west of Casper, Wyoming). The entire Platte River drainage basin was eroded as valleys systematically eroded headward into Colorado and Wyoming to capture immense southeast-oriented glacial melt water floods. The giant melt water floods were derived from a rapidly melting North American ice sheet and were flowing in a southeast direction along and across what is today the east-west continental divide. Today it is difficult to visualize how melt water floods from a North American ice sheet could flow along and across the present day east-west continental divide, however at the time the Platte River headwaters valleys were eroded the Rocky Mountains did not stand high above the surrounding regions. The North American ice sheet responsible for the huge melt water floods was large, probably as large if not larger than the present day Antarctic Ice Sheet. The North American ice sheet was several kilometers thick and when fully developed probably stood two or more kilometers above the surrounding non glaciated surface and probably had “roots” which extended as much as one kilometer or more below the surrounding non glaciated surface. The “roots” were located in a deep “hole” which had been eroded by deep glacial erosion and which had also been formed by crustal warping caused by the tremendous ice sheet weight. At the same time the ice sheet weight was causing uplift of mountain ranges and plateau areas elsewhere on the continent, uplift which continued as the thick ice sheet melted. Evidence to be presented in yet to be published North and South Platte River drainage divide area detailed essays demonstrate Rocky Mountain uplift was occurring as Platte River tributary valleys were eroding headward into the figure 2 region. Headward erosion of the South Platte River valley captured southeast-oriented flood flow to what was at that time the newly eroded Arkansas River valley. Headward erosion of the southwest-oriented Colorado River valley next captured southeast-oriented flood flow to the actively eroding southeast-oriented Arkansas River and South Platte River headwaters valleys and flood waters on northwest ends of beheaded flood flow channels reversed flow direction to erode northwest-oriented Colorado River tributary valleys. Later, for a time southeast-oriented flood flow in the North Platte River drainage basin was captured by headward erosion of the Laramie River valley, with southeast-oriented flood waters making a U-turn in north central Colorado and then flowing in a north direction into Wyoming and then across what was then the emerging Laramie Range. The first of several massive North Platte River drainage basin flood flow reversals took place when flood waters moved directly east into the Laramie Basin and by passed the loop into northern Colorado and flowed to the developing Laramie River canyons. Today the Laramie River canyon system is a complex of anastomosing canyons eroded into and across the Laramie Range. This first flood flow reversal changed the southeast-oriented flood flow channel west of the Medicine Bow Mountains into the northwest-oriented North Platte River headwaters valley. A second massive flood flow reversal occurred when headward erosion of the deep southeast-oriented North Platte River reached the Laramie Range western end and beheaded the southeast-oriented flood flow route to the Laramie Basin. This second massive flood flow reversal created the north-oriented North Platte River valley segment upstream from the Pathfinder Reservoir area and completed development of the North Platte River valley and tributary valley system as we see it today. The massive flood flow reversals were aided by uplift of mountain regions and general uplift of the north central Colorado and south central Wyoming region. The uplift occurred as flood waters were flowing across the figure 2 map region. The question might be asked, how did the southeast-oriented melt water floods reach the North and South Platte River headwaters areas, especially since north and west of central Wyoming are additional high mountain ranges and plateaus? Again, high mountains and plateau areas north and west of central Wyoming did not stand high above surrounding regions at the time flood waters first flowed across the region. The high mountains and plateau areas emerged as flood waters crossed the region. Emergence of the high mountain ranges and plateaus may have been caused by crustal warping triggered by the ice sheet’s tremendous weight and/or by the deep erosion of significant bedrock material along major flood flow routes and deposition of that debris elsewhere. Or the high mountain ranges and high plateau areas may have emerged as flood waters deeply eroded regions surrounding them. Probably emergence of the high mountain ranges and plateau areas was caused by a combination of these factors, but whatever the cause the emergence of these high mountains and plateaus occurred as flood waters flowed across them. Initially giant melt water floods responsible for North and South Platte River valley erosion flowed in a southwest direction across the decaying ice sheet surface to the ice sheet’s western margin, which was probably located in western Alberta, with the flood waters moving to a huge southeast-oriented melt water river located along the alignment of the present day Rocky Mountain Trench in eastern British Columbia. At that time the Rocky Mountain Trench was not a deep valley, but was the location of a giant southeast-oriented melt water river, which was flowing on a surface high enough in elevation that flood waters could flow in a southeast direction into and across western Montana and then across the present day Yellowstone Plateau area and into central Wyoming. Once in central Wyoming this giant melt water river initially continued to flow in a southeast direction into north central Colorado roughly following the present day east-west continental divide location. This giant southeast-oriented melt water river was systematically dismembered from the southeast to the northwest as Rocky Mountain uplift reversed flood flow on some river channels segments while headward erosion of deep valleys (such as the southeast-oriented North Platte River valley) from both the east and the west systematically captured the immense southeast-oriented flood flow and diverted flood waters to what were then newly developing drainage systems. Figure 3: More detailed regional map showing North and South Platte River headwaters regions in northeast and north central Colorado. National Geographic Society map digitally presented using National Geographic Society TOPO software. 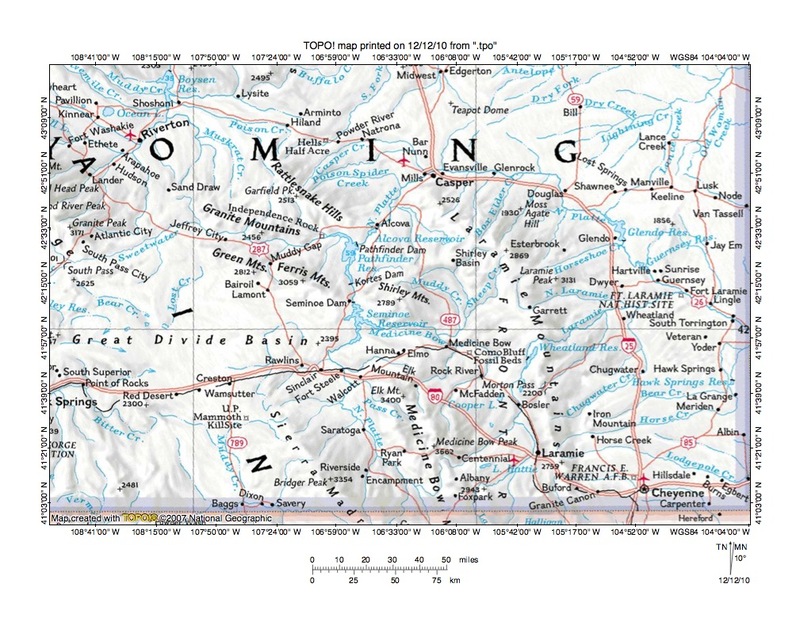 Figure 3 provides a slightly more detailed regional map showing the North and South Platte River headwaters in Colorado (more detailed than the figures 1 and 2 maps). The North Platte River originates west of Rocky Mountain National Park and flows in a northwest and north-northwest direction through Walden, Colorado to the Wyoming border and the figure 3 north edge. The Medicine Bow Mountains are the mountain range east of Walden and north- and northwest-oriented Laramie River headwaters are located north of Rocky Mountain National Park and east of the Medicine Bow Mountains. North Platte River headwaters are linked by through valleys in high mountain regions with the Laramie River headwaters and also with headwaters of the southwest-oriented Colorado River, which originates in the Rocky Mountain National Park region and which follows the railroad from Hot Sulphur Springs to the figure 3 west center edge. East-oriented Cache la Poudre River headwaters originate in almost the same place as the Laramie River headwaters (on topographic maps the two rivers are linked by well-defined through valleys, also in high mountain regions). The Cache la Poudre River flows to the northeast-oriented South Platte River while the Laramie River flows to the southeast-oriented North Platte River. Note northwest-oriented Colorado River tributaries in the figure 3 west center region, especially the northwest-oriented Blue River. The Blue River flows on approximately the same alignment as the southeast-oriented headwaters of the South Platte River. The southeast-oriented South Platte River headwaters turn (just west of the “R” located northwest of Colorado Springs) and flows in a north-northeast direction to Denver and then in a northeast direction to the figure 3 northeast corner. The southeast-oriented South Platte River headwaters valley is linked by a well-defined mountain pass eroded across the high east-west continental divide with the northwest-oriented Blue River valley. Southeast oriented streams in the figure 3 northeast corner area and northeast-oriented streams in the figure 3 east center edge area are Republican River tributaries, with the Republican River eventually flowing to the Kansas River. Northeast oriented streams near the figure 3 southeast corner are Smoky Hill River tributaries, with the Smoky Hill River being another Kansas River tributary. Southeast and south-oriented streams flowing to the south edge are Arkansas River tributaries. Today the Front Range, which is one of the Rocky Mountains’ highest mountain ranges, separates northwest-oriented Colorado River tributaries from the southeast oriented South Platte River tributaries. Yet the high mountain pass linking the northwest-oriented Blue River valley with the southeast oriented South Platte River headwaters valley provides evidence that at one time southeast oriented flood waters flowed into what was then the actively eroding South Platte River valley. Probably the southeast-oriented flood flow originally moved to what was then the newly eroded southeast-oriented Arkansas River valley, although headward erosion of the northeast and north-northeast oriented South Platte River valley captured the southeast-oriented flood flow and diverted flood waters into Nebraska. At the same time Rocky Mountain uplift was occurring and headward erosion of the deep southwest-oriented Colorado River valley captured the southeast-oriented flood flow and caused massive flood flow reversals on northwest ends of newly beheaded flood flow routes One flood flow reversal initiated development of the northwest-oriented Blue River valley. For a time southeast-oriented flood flow moved into the actively eroding Colorado River valley on both the North Platte River alignment west of what were then the emerging Medicine Bow Mountains and the Laramie River alignment east of the emerging Medicine Bow Mountains. Again Rocky Mountain uplift probably contributed to flood flow captures and flood flow reversals that systematically created present day drainage routes. One such capture was capture of southeast-oriented flood flow moving on the North Platte River alignment when southeast- and south-oriented flood flow on the Laramie River alignment was beheaded and reversed. The newly reversed north-oriented Laramie River valley near the Rocky Mountain National Park northwest corner then captured southeast-oriented flood flow from west of the emerging Medicine Bow Mountains (still moving on the North Platte River alignment). The captured flood waters made a U-turn and then flowed in a north direction on the newly reversed Laramie River alignment. Today well-defined through valleys record this flood flow route. Later, capture of the southeast-oriented flood flow route (north and west of the Medicine Bow Mountains) caused a massive flood flow reversal that resulted in development of the northwest and north-northwest oriented North Platte River valley, which today flows through North Park (the mountain-surrounded basin in which Walden, Colorado is located) and flood flow into and across what are today high Colorado mountain ranges ended. Figure 4: More detailed regional map showing North Platte River route and tributaries in southeast Wyoming. National Geographic Society map digitally presented using National Geographic Society TOPO software. Figure 4 provides a slightly more detailed regional map of the North Platte River and major tributary routes in southeast and central Wyoming (more detailed than the figures 1 and 2 maps). The North Platte River flows in a northwest direction between the Medicine Bow Mountains and the Sierra Madre Mountains in the figure 4 south center area. Just north of Fort Steele the North Platte River makes a jog to the northeast to Seminoe Reservoir and then flows in north direction to Pathfinder Reservoir. From Pathfinder Dam the North Platte River flows in a northeast direction to Casper, which is located at the northwest end of the high Laramie Mountains (which is a northern extension of the still higher Colorado Front Range). From Casper the North Platte River flows in an east direction to near Douglas and then turns to flow in a southeast direction to the figure 4 east center edge. The Laramie River flows in a north and northeast direction (east of the Medicine Bow Mountains) to Laramie and then in a north direction to Wheatland Reservoir. From Wheatland Reservoir the Laramie River flows in a northeast direction in a deep canyon eroded across the Laramie Range and then to join the southeast-oriented North Platte River near Fort Laramie. A major North Platte River tributary from the west is the Sweetwater River, which originates near South Pass seen near the figure 4 west center edge. The southeast-oriented river flowing to Riverton in the figure 4 northwest corner and which then turns to flow in a northeast and north direction to Boysen Reservoir is the Wind River, which north of the figure 4 flows through the deep Wind River Canyon eroded across the Owl Creek Mountains and then becomes the north oriented Bighorn River. The Bighorn River after flowing through another deep canyon eroded across the Bighorn Mountains north end eventually flows to the northeast-oriented Yellowstone River. North-oriented streams in the figure 4 north center area (north of Casper) flow to the north and northeast-oriented Powder River, which is another Yellowstone River tributary. Northeast-oriented streams in the figure 4 northeast corner area are Cheyenne River tributaries, with the Cheyenne River flowing in a southeast and northeast direction around the Black Hills south end and then to the southeast-oriented Missouri River. 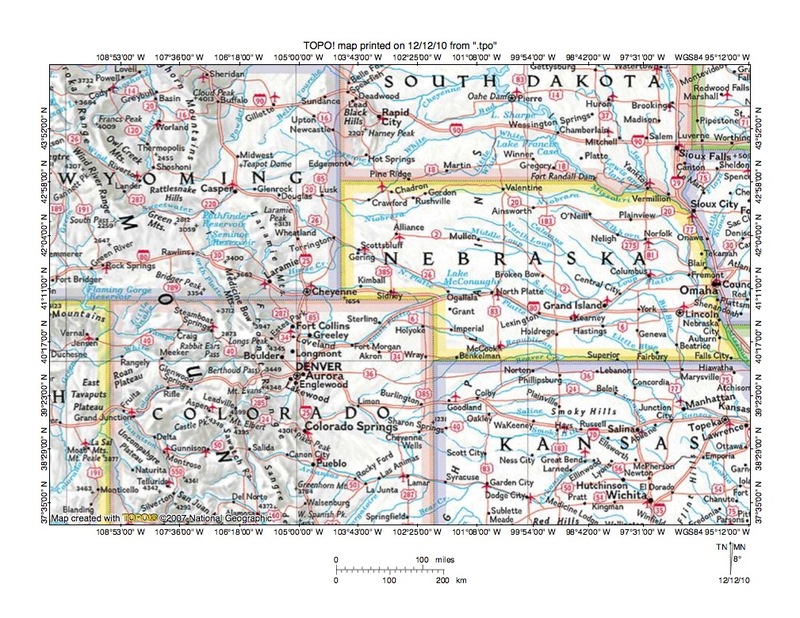 Detailed essays have been written for some figure 4 northeast quadrant drainage divide areas and can be found Cheyenne River and Powder River on the sidebar category list. Figure 4 does not show topography and does not include enough detail to show important topographic features seen on more detailed topographic maps. These features include evidence for anastomosing channel complexes, numerous through valleys eroded across present day drainage divides, and several large abandoned flood eroded headcuts. Perhaps the most intriguing of the flood eroded anastomosing channel complexes is the complex of anastomosing canyons eroded across the Laramie Mountains in the region of the present day Laramie River canyon. Several of these anastomosing canyons originate west of the Laramie Mountains and drain in an east or northeast direction to join the Laramie River canyon east of the Laramie Mountain crest. This maze of east and northeast-oriented canyons eroded across what is today a high mountain range provides evidence flood waters flowed across the Laramie Mountains as the Laramie Mountains were emerging to become the high mountain range seen today. The large east oriented Goshen Hole escarpment-surrounded basin is located directly “downstream’ from where the northeast-oriented flood flow responsible for eroding the Laramie River anastomosing channel complex would have flowed onto the plains east of the emerging Laramie Mountains. The large Goshen Hole escarpment surrounded basin was eroded headward as a giant east oriented headcut until headward erosion of the present day Laramie River valley and a north oriented Laramie River tributary valley captured the east oriented flood flow. Another large northwest oriented escarpment surrounded basin is located north of Medicine Bow and is locally known as Bates Hole. The northwest oriented Bates Hole escarpment surrounded basin was eroded by a massive reversal of southeast, east and northeast-oriented flood flow, which had been flowing in a southeast and east direction into the Laramie Basin area and then in a northeast-oriented direction through the east and northeast-oriented anastomosing canyons and then to the actively eroding east-oriented Goshen Hole headcut. The flood flow reversal responsible for the Bates Hole headcut erosion was triggered by the reversal of south-oriented flood flow when headward erosion of the deep North Platte River valley reached the Pathfinder Reservoir area and was probably greatly aided by regional uplift responsible for present day Laramie Basin and Laramie Mountains elevations. Still another large north and northwest oriented escarpment-surrounded basin is the Wind River Basin and is located north of the Sweetwater River and west of east-oriented North Platte River tributaries such as Casper Creek. The Wind River Basin was eroded by a massive reversal of southeast and south-oriented flood flow when headward erosion of the deep northeast-oriented Yellowstone River valley beheaded and reversed south-oriented flood flow moving through the Bighorn Basin and the present day Wind River Canyon to reach the North Platte River drainage basin. Following this massive flood flow reversal, which eroded northwest and west oriented Wind River tributary valleys, southeast-oriented flood flow continued to enter the Wind River Basin from the northwest and deeply eroded the Wind River Basin floor. Figure 5: More detailed regional map showing North and South Platte Rivers flowing into western Nebraska to form the Platte River. National Geographic Society map digitally presented using National Geographic Society TOPO software. Figure 5 provides a slightly more detailed regional map of North and South Platte Rivers and their tributary drainage routes and relationships with adjacent drainage basins in western Nebraska (more detailed than the figures 1 and 2 maps). The South Platte River flows in a northeast direction in the figure 5 southwest quadrant to the Colorado northeast corner and then in an east direction to join the southeast and east-oriented North Platte River near North Platte, Nebraska. Note how the northeast oriented South Platte River has extensive southeast and east-oriented tributaries from the west. Also note how streams immediately to the southeast of the northeast oriented South Platte River are oriented in a southeast direction, with the streams flowing (if they flow) to the east-oriented Republican River (located near the figure 5 south edge in the southeast quadrant). This evidence strongly suggests the northeast-oriented South Platte River valley eroded headward across multiple southeast oriented flood flow channels such as might be found in a large-scale southeast oriented anastomosing channel complex. Detailed essays describing all Nebraska Republican River drainage divide areas have been written and are found under Republican River on the sidebar category list. Flood waters would have had to cross the Laramie Mountains to reach the South Platte River valley, but as the Laramie Mountains were in the process of emerging at the time flood waters were able to flow into the figure 5 map area. The southeast oriented North Platte River valley was eroded headward around the emerging Laramie Mountains and has extensive tributaries flowing from canyons eroded into and across the Laramie Mountains. As already described these canyons can best be described as having been formed by anastomosing flood flow channels in which flood waters continued to flow while the Laramie Mountains emerged around them. North of the North Platte River in western Nebraska is the southeast, northeast, and east-oriented Niobrara River and north of the Niobrara River in the Nebraska northwest corner is the southeast and northeast oriented White River, with the White River flowing in an east direction north of the figure 5 north edge. Between the White River and the Niobrara River (except in the Nebraska northwest corner) is the north-facing Pine Ridge Escarpment, which separates high plains regions to the south from low plains to the north. Detailed essays describing all Niobrara River and White River drainage divide areas have been written and are found under their respective river name on the sidebar category list. Located between the Niobrara and North Platte (and Platte) Rivers is the Nebraska Sand Hills region. East and southeast-oriented Loup River tributaries originate in the Sand Hills region, but otherwise most drainage routes are obscured by the sand hills. The Sand Hills region probably represents the location of what was once an area where converging flood waters from the west and northwest deposited extensive deltaic deposits as they entered large temporary lakes. The temporary lakes were formed as immense melt water floods from different ice sheet locations and flowing along different flood flow routes converged in what is today Nebraska. At that time the Missouri River valley and its tributary valleys were just beginning to erode headward into what is today the state of Nebraska and at least for a time there were no deep valleys to drain the immense floods from the region. As already noted immense east-oriented floods flowed into Nebraska from the emerging Rocky Mountain region in Colorado and Wyoming. Southeast-oriented ice-marginal melt water floods flowed into Nebraska from the northwest (at that time the Pine Ridge Escarpment did not exist and the plains to the north were at least as high as the high plains south of the Pine Ridge Escarpment. Also, in eastern Nebraska (east of the figure 5 map area) immense south-oriented floods were flowing directly from large south-oriented ice-walled canyons carved by giant melt water rivers into the decaying ice sheet’s surface. Headward erosion of the east-oriented Republican River valley (from the Kansas River valley in eastern Kansas, which had eroded headward from the actively eroding Missouri River valley) first captured flood waters in the figure 5 map area and began to drain ponded flood waters from the region. Headward erosion of the Missouri River-Platte River valley and tributary valleys subsequently captured the flood flow and further drained the ponded flood waters from the figure 5 map area. Finally headward erosion of the Missouri River-Niobrara River valley captured southeast-oriented flood flow from the northwest. At approximately the same time Rocky Mountain uplift and massive flood capture events and flood flow reversals in Wyoming ended flood flow from the west. Figure 6: More detailed regional map showing Platte River route and tributaries in central and eastern Nebraska. National Geographic Society map digitally presented using National Geographic Society TOPO software. Figure 6 provides a more detailed regional map of Platte River and tributary drainage routes in eastern and central Nebraska (more detailed than the figures 1 and 2 maps). The Platte River flows in a southeast direction from North Platte, Nebraska to near Kearney, Nebraska and then in a northeast direction to Columbus. Between Columbus and Fremont the Platte River flows in an east direction before turning to flow in a south direction and then east-northeast direction to join the south-southeast oriented Missouri River. Major Platte River tributaries from the north include the Elkhorn and Loup Rivers. The Elkhorn River flows in a southeast direction in northeast Nebraska before turning to flow in a south-southeast and south direction to join the south-oriented Platte River west of Omaha, Nebraska. Detailed essays describing all Elkhorn River drainage divide areas have been written and are found under Elkhorn River. North of the Elkhorn River headwaters area is the Niobrara River. West of the Elkhorn River drainage basin is the Loup River drainage basin. Major Loup River tributaries originate as east- or east-southeast-oriented streams in the Nebraska Sand Hills region and then turn to flow in southeast and south-southeast directions to the northeast-oriented Loup River, which joins the Platte River near Columbus. While not obvious from the figure 6 map the northeast-oriented Loup River for most of its distance flows along the northwest wall of a broad northeast-oriented valley shared with the northeast-oriented Platte River, which flows along the valley’s southeast wall. Detailed essays provide topographic maps to illustrate this relationship and also show how these northeast-oriented channels also relate to channels of other northeast-oriented streams using the same valley. Positions of these river channels in the broad valley as seen on the topographic maps is interpreted as evidence that immense southeast-oriented floods (from the northwest) converged with immense northeast-oriented floods (from the west) in this broad northeast-oriented valley. Southeast-oriented flood waters flowing into what was then the newly eroded valley were forced to flow along the valley’s northwest wall while flood waters from further to the west flowed along the valley’s southeast wall. Detailed essays describing all Loup River drainage divide areas have been written and are found Loup River. South of the southeast-oriented Platte River and east-oriented South Platte River in the figure 6 southwest quadrant is the east-oriented Republican River, which near the figure 6 south center edge turns to flow in a southeast direction to flow to the east-oriented Kansas River. Note how the drainage divide area between the South Platte-Platte River and the Republican River is drained primarily by southeast-oriented Republican River tributaries. Topographic maps show north and northwest-oriented Platte and South Platte River tributaries and also show through valleys linking the north oriented Platte and South Platte River tributary valleys with the southeast-oriented Republican River tributary valleys. This evidence is interpreted to mean Republican River valley headward erosion captured multiple southeast-oriented flood flow channels and subsequently Platte River and South Platte River valley headward erosion beheaded those southeast-oriented flood flow channels with flood waters on north and northwest ends of the beheaded flood flow channels being reversed to erode north and northwest-oriented Platte River and South Platte River tributary valleys. In the figure 6 southeast quadrant the east-northeast and south-southeast oriented Big Blue River is located south of the northeast-oriented Platte River valley segment. The Big Blue River flows to the east-oriented Kansas River. Detailed essays describing all Big Blue River drainage areas have been written and are found Big Blue River. Of special interest is the fact the east-northeast Big Blue River headwaters originate almost along the edge of the northeast-oriented Platte River valley, suggesting headward erosion of the Platte River valley beheaded flood flow which had been moving to what was then the newly eroded south-southeast oriented Big Blue River valley. Note how in eastern Nebraska the Platte River turns to flow in a south direction and its tributary Elkhorn River also flows in a south-southeast and south direction. Also note in northeast Nebraska how an unlabeled, but important Elkhorn River tributary flows in a south-southeast and south direction. Further south in the Nebraska southeast corner the Big Blue River flows in a south-southeast direction and the Missouri River is also oriented in a south-southeast direction. 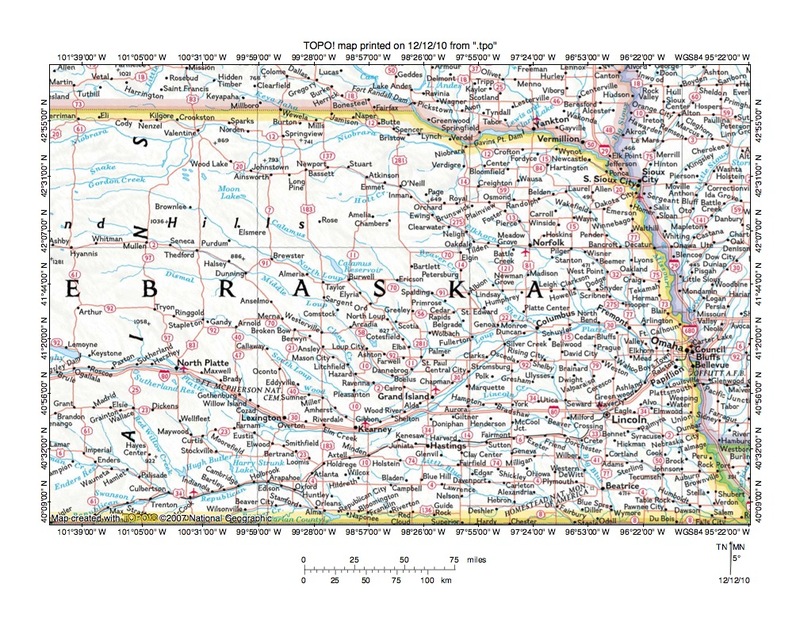 The south-southeast and south orientations of many eastern Nebraska river and stream segments is a relic of south-oriented melt water flood flow routes which once crossed the region. The south-oriented floods were derived from immense south-oriented melt water rivers which emerged from large south-oriented ice-walled canyons which had been carved into the decaying ice sheet’s surface. At that time the ice sheet’s southwest margin was located just north of the southeast and east-southeast oriented Missouri River segment located between South Dakota and Nebraska in the figure 6 northeast quadrant. The large south-oriented melt water rivers probably carried large icebergs into eastern Nebraska and those icebergs probably rafted considerable glacially transported debris into the eastern Nebraska and northeast Kansas regions. It is possible the ice sheet never extended south and west of the present day Missouri River valley, although deep melt water flood water erosion has probably destroyed all evidence of the ice sheet’s outer margins. It is also possible the ice sheet at one time covered significant Nebraska regions, although the surface on which the ice was located has been completely removed. In either case, evidence for ice sheet margins in eastern Nebraska and northeast Kansas needs to be evaluated to determine flood water deposition of debris. This Nebraska Platte River drainage basin landform origins overview essay and its related detailed essays is one of a series of overview essays and related detailed essays in the Missouri River drainage basin landform origins research project. The research project goal is to use topographic map evidence to describe the evolution of drainage divides separating each significant present day Missouri River tributary valley and also to describe the evolution of drainage divides separating the present day Missouri River drainage basin from adjacent drainage basins. Each overview essay and its related detailed essays pertains to a specific Missouri River tributary, tributary to a present day Missouri River tributary, or a present day Missouri River valley segment. Each detailed essay illustrates and discusses detailed topographic map evidence describing the evolution of a secondary drainage divide separating specified Missouri River tributary valleys. The Missouri River drainage basin research project introduces a new regional geomorphology paradigm. An essay titled “About the ‘thick ice sheet that melted fast’ geomorphology paradigm” provides a brief introduction to the new paradigm and how the new paradigm emerged. Detailed evidence illustrated and discussed in the Missouri River drainage basin research project builds a strong case for (1) deep glacial erosion of the North American continent by a thick North American ice sheet that created and occupied a deep “hole”, (2) rapid melting of that thick North American ice sheet, (3) immense floods of south-oriented melt water, (4) headward erosion of deep east, northeast and north-oriented valley systems to capture the south-oriented melt water floods and to divert the melt water further and further northeast into space the ice sheet had once occupied, (5) deep flood water erosion of the North American continent surface, and (6) crustal warping that resulted in uplift of mountain ranges as flood waters were deeply eroding what are now high mountain regions. This interpretation is fundamentally different from most previous interpretations. The Nebraska Platte River drainage basin evidence in this overview essay and its related detailed essays is presented for review and discussion by qualified research geomorphologists and geologists. This essay has only provided a sample of the drainage divide evidence supporting the “thick ice sheet that melted fast” geomorphology paradigm. Many additional examples could be provided, especially by using more detailed topographic maps. Readers are encouraged to look at mosaics of detailed topographic maps to see the abundance of supporting data. 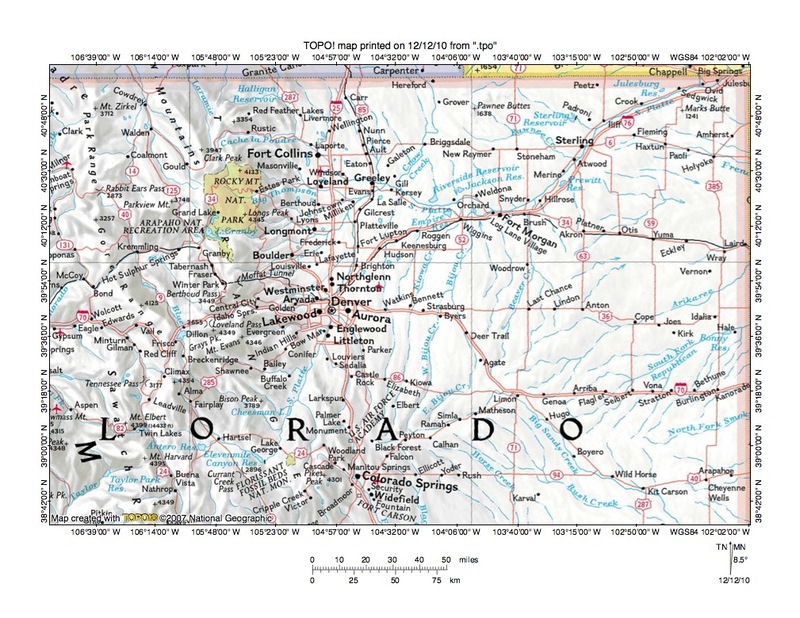 Maps used in this study were created by the United States Geological Survey and can be purchased in hard copy from the United States Geological Survey or from dealers offering United States Geological Survey maps. 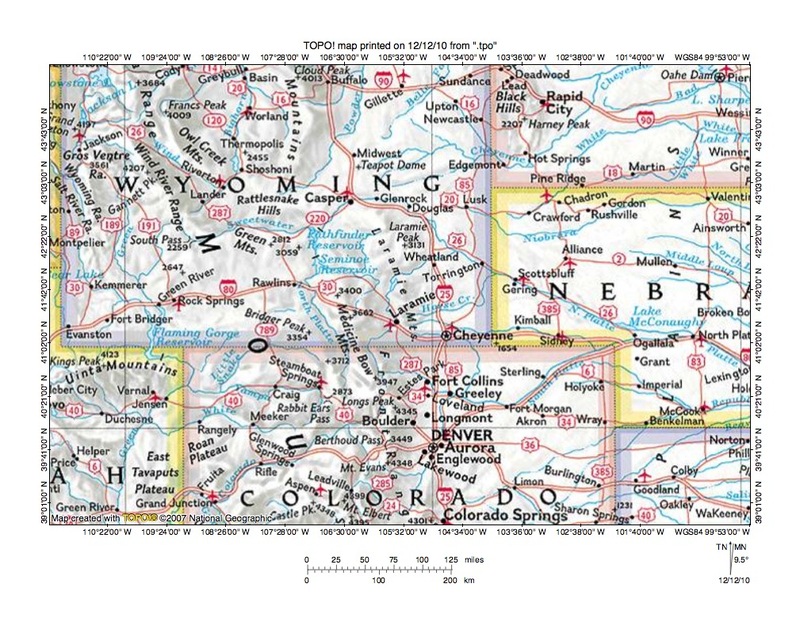 Hard copy maps can also be observed at United States Geological Survey map depositories located in major research libraries and elsewhere throughout the United States and in other countries. Illustrations used in this essay were created using National Geographic Society TOPO software and digital data. National Geographic Society digital maps can be purchased from the National Geographic Society or from dealers offering National Geographic Society digital maps. Note: regional maps used in this essay, which are not topographic maps, were created by the National Geographic Society. Topographic maps used in the study are included in the detailed essays.